We leave the wild mountains and Walrus of Svalbard behind and enter a heavy, ‘following sea’. White crests roll over the top of deep blue waves that the Saga Pearl II almost surfs down. We follow the coast south, over on the distant horizon the mountains still rise hazy blue. The conditions are not conducive to whale watching, and it is a couple hours before we see our first big mammal. A Sei Whale surfacing against the waves, lifting its head high to catch a clear breath. The wind then starts to drop, the number of white caps melting away, the waves dropping in height. Conditions were improving. Then ahead it was as if someone had drawn a line on the horizon. Slowly it approached and it seems as if the team are holding their breath, not quite believing the conditions beyond. Crossing it was like passing into a magical world, a whale watchers paradise. The wind disappears completely and the ocean becomes silky smooth, the slight cloud cover casting a silvery sheen and the sightings increase. Humpback Whales, White-beaked Dolphin and Minke Whales all in quick succession. Ahead three blows catch the eye. One then two are identified as Humpback Whale, the blow bushy, a dark body and humped back beneath. But the third is massive and thin. I catch my breath, scanning, searching, hoping to see this particular whale again. Once again a massive blow reaches into the pale blue silvery sky and beneath, not a dark body, but a pale and huge body. It is a Blue Whale. The largest animal that has ever lived on this planet we call Earth. I cannot contain my excitement, as I whoop and leap around the deck much to the amusement of the passengers. 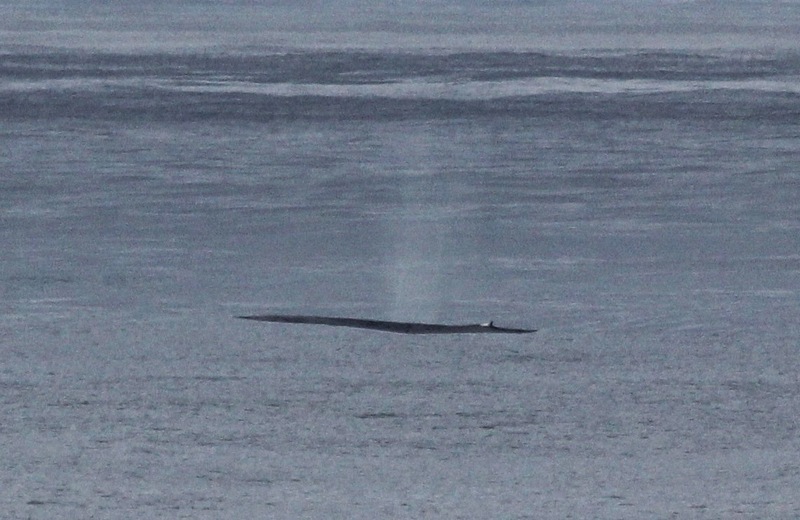 But it is not over, with the Humpback and Blue Whale still in sight another animal surfaces, this time a Fin Whale. Three species of incredible animals within the space of five minutes. Like I said, it was a magical kingdom. Still we cannot linger, and continue our journey south. Once more something catches the eye. Amongst the silvery calm, water boils, like fish at the surface but then something dark pops up. It does not roll like a whale. It is too big with too many repeated bobbings for birds. No dorsal fin like a dolphin, just a snout and rounded body. Closer inspection reveals that they were seals. But which species? Never had I seen seals behave like this, accelerating vertically up out of the water. I never pretend to know everything, that would be arrogant and pretentious. 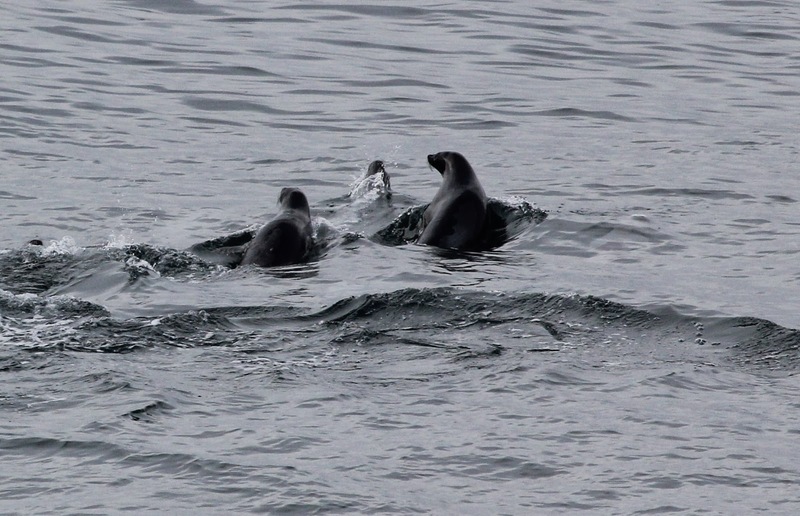 So it was with the help of a passenger that we identify these as Harp Seals. But we are not talking about one or two seals, great swathes of water boil ahead and alongside the ship as hundreds of Harp Seals surface in various groups over a period of half an hour! The following day, and no longer can we see the mountains of Svalbard. All around us the ocean extends from either horizon. It is an overcast day, showery, but importantly still calm. Following the unseen continental slope the day brings over 50 sightings. Half way through the morning an adult and juvenile Humpback Whale surface close to the ship. 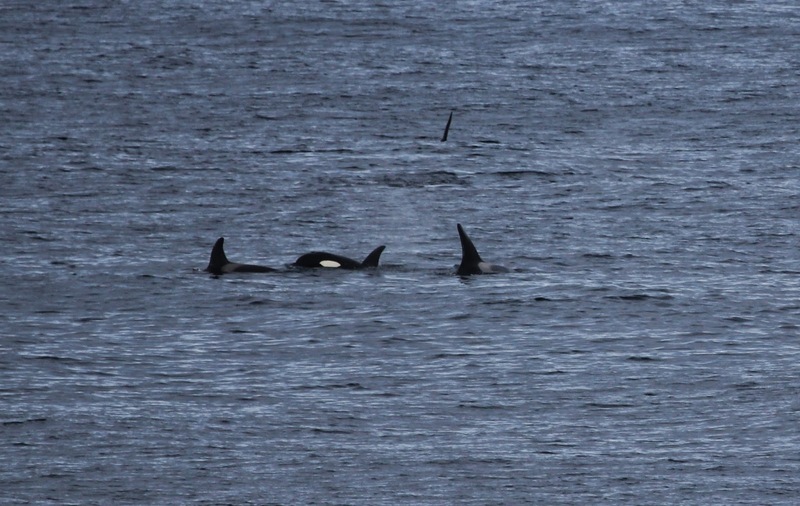 They are here to make the most of rich feeding grounds after an epic journey from the warm tropical waters where her calf would have been born. A frenzy of Fin Whale sightings just after lunch keeps the team on its toes, with many surfacing so close to the ship you can almost see down their blow holes. A huge blow signals what was probably our second Blue Whale of the trip, although it remained more elusive than the first. A Sperm Whale lifts its fluke diving to find the squid roaming the dark depths beneath us. Flashes of silver fish are patrolled by Minke Whales. A Sei Whale surfaces amongst the mist of a heavy shower, a Fin Whale just behind it. White-beaked Dolphin leap amongst shards of light breaking through the clouds. The final leg of our journey takes us back along the coast of Norway, from Tromso, through the meandering, steep sided fjords of Geriangerfjord, to the bustle of Bergen. Low lying mist threads its way through scattered islands, shrouding the feet of towering snow capped mountains. The sea once again is silvery and smooth and in such conditions it is not hard to spot the dark, black shapes of Long-finned Pilot Whale, the breach of distant feeding dolphins and the quick roll of Harbour Porpoise. Mid-morning and far ahead something black once again breaks the surface. Zeroing in and several, tall dark fins emerge from the silvery sea and with a growing sense of excitement we realise there is just one thing they can be. Orca. The mingling group of at least eight includes at least three big bulls, one with a dorsal fin immense not only in height but width. As the ship comes alongside the group one male leaps completely clear of the water landing with a huge splash and a roar of delight from the watching passengers. As the ship passes, slipping onwards on its inexorable path south, the group continues to mill with several younger animals also leaping clear of the water. Cue massive, silly grins on everyones faces. Through the steep sided, meandering water ways of Geraingerfjord and even the more muted, softer, rounded islets and islands of the fjord off Bergen, we watch Harbour Porpoise surface amongst the dark wavelets. Tiny calves surface in close synchronisation with their mothers, causing a ripple of delight amongst those the most perseverant of passengers still on deck. The final stretch of North Sea proves more productive than the journey north with a group of five Minke Whales causing a stir at the breakfast table. Rain and wind finally close in and the team bids a final farewell to the survey deck. For the first time in a long time the sun sets fully, darkness falls and when it is light again we are greeted by white, not of glinting snow caps, but of white, sheer cliffs of chalk. We were back in Dover and our Arctic adventure is over. For now.